Secaucus, New Jersey- Employees of the Jersey Journal, owned by billionaire Donald Newhouse, protested Monday outside of the paper’s new office building during its grand opening in Secaucus and demanded executives negotiate a fair contract that will raise wages and provide reasonable benefits. The Journal has been in a contract dispute with its employees and their union, the Newspaper Guild of New York, CWA Local 31003, since January 2013. The writers, editors, reporters, videographers, and photo journalists that produce The Jersey Journal’s content haven’t had a raise in 5 years and executives are refusing to bargain over reasonable wage increases. Over the same period, the news stand price of the paper has increased 100% and the paper’s headquarters was sold for $2.8 million. "Readers of the Jersey Journal pay more for the paper now than they did five years ago, and its owners just made $2.8 million selling its longtime headquarters in Journal Square," said Terrence T. McDonald, Local Newspaper Guild Unit Chair at The Jersey Journal. "Yet our members, who continue to be asked to take on more responsibilities, have gone nearly five years without an increase in pay. This is unacceptable. Without us, there would be no paper, only white space." A union member told Capital reporter, Joe Pompeo, that starting salaries in the roughly two-dozen-person newsroom have been lower than $50,000 a year since at least 2008 and that reporters and photographers are increasingly expected to do more with less. "All we're looking for is for our management to sit down with us and negotiate," Jersey Journal reporter Terrence T. McDonald told Capital. The unrest at the Journal adds to a larger climate of anxiety at Advance's Jersey publishing stable, which includes 10 other newspapers and the web portal www.nj.com. Advance's crown jewel in the Garden State, The Star-Ledger, was brought to the brink of closure last fall as its trade unions battled over concessions with publisher Richard Vezza. Throughout the chain, journalists are on edge over a recent announcement that Advance is looking at ways to consolidate its Jersey titles. Fears abound of massive downsizing such as that which has occurred at other Advance newspapers over the past few years, most notably The Times-Picayune of New Orleans. The Jersey Journal is a six-day tabloid that has fallen far from its glory years as a well-respected broadsheet. These days it focuses mostly on pithy bursts of crime and municipal news. But it remains the major news source for an area that is booming with development and small-business growth as New Yorkers migrate west in search of more affordable housing. According to the Alliance for Audited Media, average weekday circulation for the six months that ended Sept. 30 was down to a little over 14,000 from 16,500 during the same period in 2012. The paper recently vacated a historic building that gave Jersey City's Journal Square neighborhood its name. 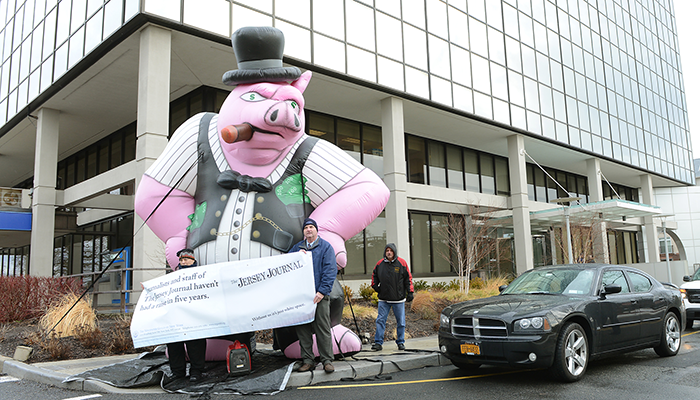 A big fat cigar-smoking pig was inflated outside the new offices in nearby Secaucus ahead of this afternoon's union action. Instead of negotiating in good faith, the Journal has refused to entertain any proposal that increases their operating costs and refuses to open their books to show financial need. The employees at the Journal are asking for a raise in order to support their families.